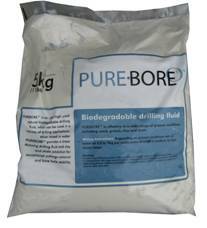 Pure-Bore is a dry free flowing polymer that mixed with water produces a natural biodegradable drilling fluid, which can be used in a variety of drilling applications. provides exceptional bore hole stability and cuttings removal in a wide range of ground conditions. Pure-Bore is packaged in 5Kg clear plastic bags (5 x 5Kg bags per cardboard case).